Is design really about problem-solving? And if so, how often are those problems really serious? An event in Los Angeles this coming Thursday aims to tackle some really weighty challenges, such as ‘isolation’, ‘traffic’ and ‘earthquakes’. The evening is organised by the remarkable Good (see Jason A. Tselentis’s article ‘Like they do give a damn’ about the magazine in Eye no. 63 vol. 16). And it’s hosted by Good’s Casey Caplowe and design writer (and Eye contributor) Alissa Walker. 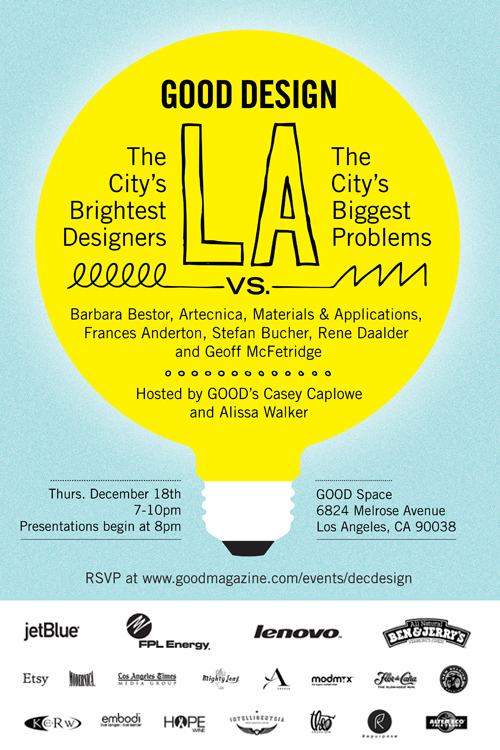 If you’re interested, RSVP to www.goodmagazine.com/events/decdesign. Top: invitation designed by Keith Scharwath, www.scharwath.com.